My name is Matt Winick, an Asian American with a strong interest in learning history and social justice. In these subjects, I like to learn the need to make Civil Rights stronger to reduce discrimination and have criminal justice reform to help protect people’s rights while reduce crime. U.S. District Judge Gee, the main reason I’m writing you a letter is to explain how I find your work in the U.S. District Court for the Central District of California and your activism in the Asian American community to be very inspiring to me. 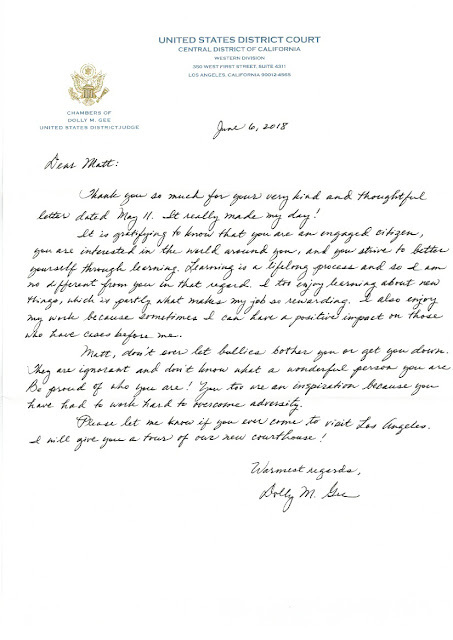 In August 2009, I liked on how you accepted President Obama to nominate you to serve on the U.S. District Court for the Central District of California to help him improve the judicial system. In March 2010, I was amazed on how you made history by becoming the first Chinese American woman to be U.S. District Judge in the U.S. District Court for the Central District of California. In your current role as U.S. District Judge, I truly appreciate on how you are a strong supporter of Civil Rights by advocating for people with disabilities’ rights, pushing for strict sentencing for people who commit hate-crimes to help protect minorities including people who are different, and working hard to help protect Civil Rights from being violated. Supporting the idea of drug treatment programs to help drug-users get the care they need to reduce drug abuse, expanding on law enforcement resources including the court resources to help victims of crime including victims of domestic violence get help on reducing their trauma, and express the need to improve funds for forensic science including DNA testing to help reduce sending an innocent person to jail including solve cases efficiently is common sense for criminal justice reform. Another thing that I liked about your work in the U.S. District Court for the Central District of California is how you are protecting our basic civil liberties like the fourth amendment to help protect people form unreasonable searches and many others. Besides your work in the judicial career, I especially like on how you are active for the Asian American community by advocating for Asian Americans with disabilities’ rights, supporting Asian American rights including immigrants, expressing the for more educational awareness about Asian American culture. U.S. District Judge Gee, I have autism with a learning disability. Having a disability is hard for me because I have trouble comprehending on learning different advance subjects, sometimes I struggle to communicate my thoughts, and get teased. Your commitment to be a strong supporter of Civil Rights including people with disabilities’ rights really inspires me to work hard on my disability. Also being an Asian American with a disability is difficult for me because some Asians including some Asian Americans tease me including get judgmental about me being different from them. Your continuous commitment to be a strong supporter of the Asian community and advocate for Asian American with disabilities’ rights gives me some inspiration to continue to be proud to be an Asian American when I face struggles in fitting in. On Youtube NAPABANational Inspirational Video Series Judge Dolly Gee, I really had fun learning about your early life being born to Chinese immigrants, how you decided to go into law career, and express the need for criminal justice reform. Your current role as U.S. District Judge for U.S. District Court for the Central District of California gives me motivation to continue to learn history and social justice. My future goal is to someday work in these areas to help emphasize the need to make Civil Rights stronger to reduce discrimination, have criminal justice reform to help protect people’s rights while reduce crime, and many others. 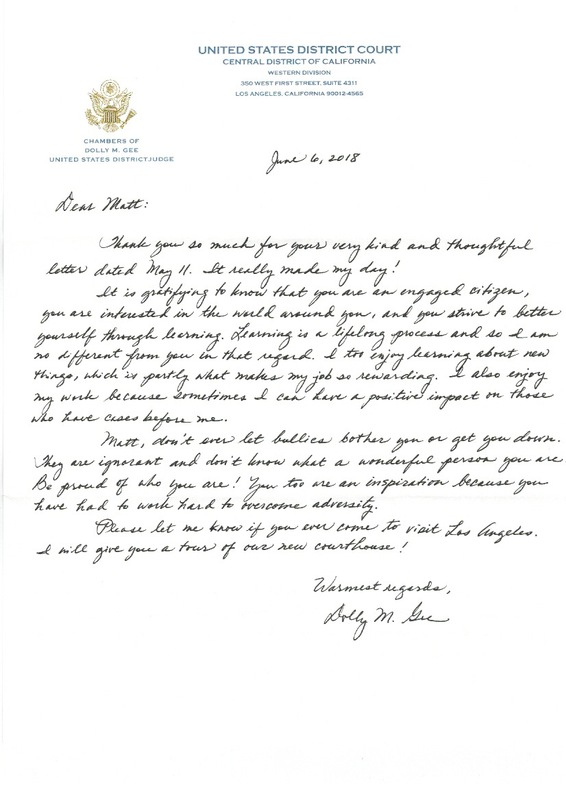 My letter is a gift to you for inspiring me and for May Asian Pacific American Heritage Month to help recognize Asian Americans who work hard to make a great difference for society. I strongly believe that you are making a great difference in the judicial system. I’m very proud on how you are working hard to support Civil Rights, help the Asian American communities, and push for criminal justice reform. You have inspired me to work hard on my disability, be motivated to continue to learn history including social justice, and continue to work hard on being confident about being an Asian American with a disability. Thanks for taking the time to read my letter, working hard to improve society, and inspiring me. I wish you the best to continue to make a great difference for society and the criminal justice system, and the Asian American community.